Cavity Myths in Long Grove Busted! We all have the common knowledge that cavities are bad for our teeth. 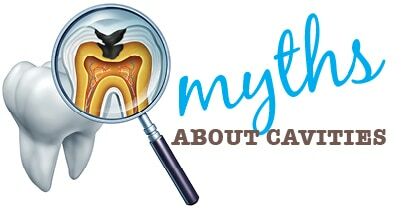 However, even though we know that cavities should be avoided, there are some widely accepted beliefs about cavities that are actually myths. At Long Grove Dental Studio, we want to alleviate some of the confusion that goes along with trying to separate cavity myths from reality. One of the most commonly accept myths about cavities in is that sugar is the #1 cause. While there is a bit of truth to it, the sugar itself doesn’t cause the decay. It’s actually the acid that’s created when carbohydrates like sugar are eaten. When you eat carbohydrates, the bacteria in your mouth are triggered to make acid. It’s this acid that makes eating sugar and other carbohydrates so dangerous for your smile — it eats into your teeth creating cavities. A second myth that we’d like to debunk is that cavities in baby teeth are nothing to worry about. In reality, if cavities in baby teeth are left untreated, they can develop into abscesses and can cause a lot of pain. Additionally, not only will it be painful, the infection can also actually spread to other areas of the body. An alarming myth for our Long Grove dental office is the one that states you’ll know when you have a cavity. In reality, mild tooth decay doesn’t have any symptoms. It’s when the decay becomes more advanced and begins to cause nerve damage that you can feel pain. This is one reason keeping up with exams in our Long Grove dental office is so important. If we can catch a cavity before it causes pain, we can not only keep you pain free, we can also help you avoid more in-depth procedures like a crown or even a root canal. If you’re overdue for a check up, call Long Grove Dental Studio today. We’ll perform a comprehensive exam, work with you to treat any cavities that may be developing, and get your smile healthy and pain free.